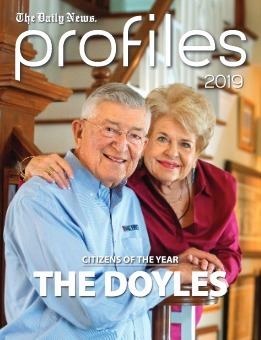 Carole Gard and her husband, Bob, are 2019 Everyday Heroes. Bob and Carole Gard grew up in small towns — he in Alpine, Texas, and she in Camden, Arkansas. Both had parents who worked to improve their communities through church and volunteer efforts. When the couple made their home in Galveston 45 years ago, it was natural for them do the same. The Gards are “the heart and soul” of many island charities and have made service the central part of their lives, said Mary Ferris, who nominated the couple to be Daily News Everyday Heroes. They deliver dinners each week for Meals on Wheels, and they cook and serve a monthly dinner of red beans and rice at The Salvation Army. As active members of Moody United Methodist Church for more than four decades, Bob and Carole participate in many church functions, including her work on the Moody Methodist Permanent Endowment Fund and their combined efforts as board members for Libbie’s Place, a facility for seniors. Through membership in a masonic lodge, Bob has volunteered his management skills to Shriners Hospitals for Children and is an emeritus member of its board of governors. An Air Force veteran, he meets, mentors and assists veterans, and works as a volunteer ombudsmen for the Family Medicine program at the University of Texas Medical Branch. Bob and Carole met in the 1960s in the cafeteria of Methodist Hospital in Houston, where she was working as a therapist and he was a cardiac technician at nearby Baylor Medical Center. Their first date was to the movie version of “Taming of the Shrew.” Carole, an occupational therapist for 40 years, was the longtime director of Galveston’s Early Childhood Intervention program, and Bob worked in office management. The Gards have identical twin daughters and four grandchildren. “Bob is my inspiration,” Carole said. “When someone asks if he can do something that needs to be done, he almost always says yes. He makes me want to say yes, too.